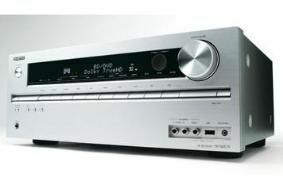 Onkyo launches its first 2011 receivers | What Hi-Fi? The line-up also brings 4k video capability to the receiver market, and offers network audio streaming at a new low price-point – the TX-NR579 offers both of these features at £450, while the £350 TX-NR509 has audio streaming. At the top of the initial range is the 7.2-channel TX-NR609, at £500: it's THX Select2 Plus certified, and is the first home cinema receiver in the world to use the Marvell Qdeo video processor, allowing upscaling of video to a maximum of 3840x2160 pixels (aka 4k resolution). The 609 also has front-panel USB port for direct digital iPod/iPhone connection, as well as providing playback from USB memory devices. It has six HDMI inputs, a powered Zone 2 facility, analogue RGB video input for computer connectivity, and two subwoofer outputs. The £450 TX-NR579 is a 7.1-channel receiver, and drops the 609's THX certification, PC video connectivity, Audyssey DSX and second subwoofer preout. It has four HDMI inputs. Step down to the five-channel TX-NR509 (£350) and you get a non-powered Zone 2 output, while Audyssey DSX and Pro-Logic IIz are also omitted, along with the 4K video scaling. Finally the budget TX-SR309 (£250) drops networking, Zone 2 and Audyssey features, and has three HDMI inputs. The TX-SR309 will be on sale at the end of this month, with the RX-NR509 on sale soon after, and the two upmarket models in the shops at the end of March.